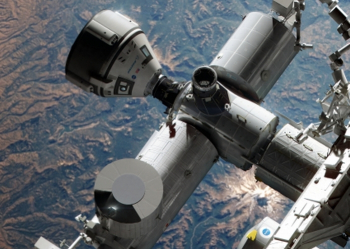 Mission planners at NASA have installed four Commercial Crew demonstration missions into the International Space Station (ISS) manifest. 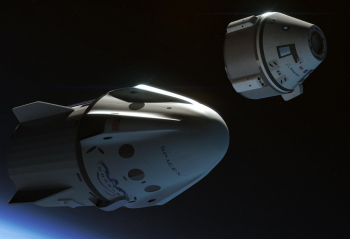 Both SpaceX’s Dragon 2 (V2) and Boeing’s CST-100 will conduct uncrewed and crewed qualification missions – beginning as early as December, 2016 – prior to the awarding of the US Crew Vehicle -1 (USCV-1) mission for NASA. 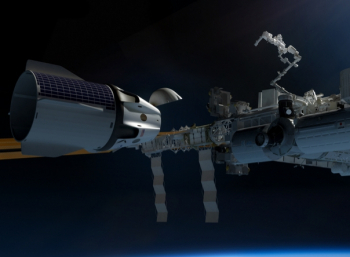 The path towards regaining American independence for its crew transportation needs has fostered a collaboration between the innovation of American industry and the experience of NASA. While this association isn’t unique for NASA – with the Agency’s previous crew transport, the Space Shuttle, cared for by numerous parties within the aerospace industry base – the Commercial Crew approach is a major evolution, with NASA handing over the operation of vehicles to the contracted companies. Four major players have been involved with the Commercial Crew approach, SpaceX, Boeing, Blue Origin and SNC. While Blue Origin’s path utilized NASA’s experience, it has been on the sidelines, given its development has lacked actual funding from the Agency. However, it has allowed them to advance, with numerous deals currently keeping the company occupied, such as developing the BE-4 engine for the United Launch Alliance (ULA). SNC – with its Dream Chaser vehicle – were deeply involved with the Commercial Crew program, prior to losing its standing via the downselect in the Commercial Crew Transportation Capability (CCtCap) contract award decision. 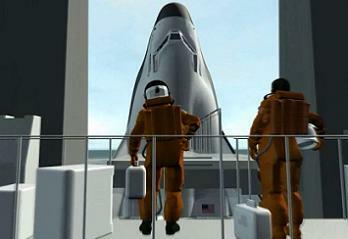 Despite a failed protest against the decision, the company is still working on its remaining milestones in its Commercial Crew integrated Capability (CCiCap) funding, although it has since released a large amount of its Dream Chaser workforce and it is not yet certain whether or not they will conduct a second free flight test. The two CCtCAP winners, Boeing and SpaceX are continuing their development effort, as they both press forward to launching their vehicles to the International Space Station (ISS) on what will be hugely historic missions. Boeing’s CST-100 is rather “media shy” when compared to SpaceX’s vehicles, although recent announcements have shown work with the vehicle is making progress, while preparations are being made to renovate Cape Canaveral’s Space Launch Complex – 41 (SLC-41). Changing the skyline for the new era will be a crew access tower that will allow astronauts to once again ride atop of the veteran Atlas rocket. 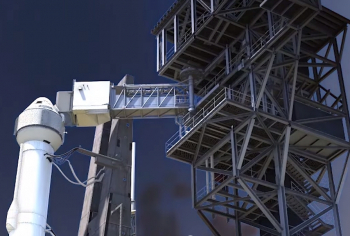 The work on the access tower – which includes an elevator and a 42 foot long arm with its own white room – will be conducted in-between regular launches of the Atlas V and is expected to be completed in 18 months time. SpaceX’s next visible sign of progress for its commercial crew ambitions will be the pad abort test from the nearby SLC-40. 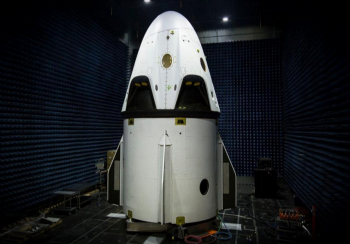 The pad abort vehicle is a close match to the Dragon 2 (as it is internally known as, as opposed to the V2 name it was giving during its announcement), at least from its Outer Mold Line (OML). It is set to launch from a mount located at SLC-40, although there is no firm date for this event. A previous placeholder of March 4 has since moved to mid-March, although it remains to be seen if SpaceX will attempt the test before the next scheduled launch of its Falcon 9 v1.1, set to loft the TurkmenistanSat spacecraft – which is set for March 21. Both companies will be working through their CCtCap milestones with a firm eye on launching their spacecraft on test runs to the International Space Station by at least 2017. As recently noted at political hearings, the dates are projections, based on required funding from NASA’s budget being realized. It was stated – once again – that such funding needs to be protected, in order to ensure the schedules do not slip. As pointed out during the hearings, notably by Representative Dana Rohrabacher, it needs to “sink in” that short-changing the Commercial Crew program would likely result in more money heading to Roscosmos to fill the gap with payments for Soyuz seats to ensure a continued US presence on the Station. Based on the current projections, NASA’s Flight Planning Integration Panel (FPIP) team has – for the first time – installed projected dates (L2) for the historic test flights of both Dragon 2 and CST-100. For Boeing, its CST-100 will first launch on an uncrewed test flight to the Station via the “Boe-OFT” mission in Apr, 2017 – on a 30 days mission, ending with a parachute assisted return. Should all go to place, the second mission will involve a crew – yet to be selected – on a mission designated “Boe-CFT”, launching in July, 2017, on a 14 day mission to the ISS. The FPIP dates show SpaceX to be the most advanced in the Commercial Crew path, with their projected test flight dates currently set to win the honor of being the first Commercial Crew vehicle to arrive at the orbital outpost. That first Dragon 2 mission, designated “SpX-DM1”, has a December, 2016 launch date, ahead of a 30 day mission – most of which will be docked to the ISS – ending with a parachute assisted landing in the Pacific ocean. This would be followed by “SpX-DM2”, a crewed flight, launching in April of 2017, on a 14 day mission. This would mark the first time astronauts have launched from American soil on a US built spacecraft since Atlantis’ STS-135 mission in 2011. The April target would also overlap with the proposed date SpaceX’s CRS-14/Spx-14 Commercial Resupply Services (CRS) mission would be already berthed to the Station – based on the extension of resupply missions, ahead of the CRS2 award – potentially marking another first, with two SpaceX spacecraft at the ISS at the same time. 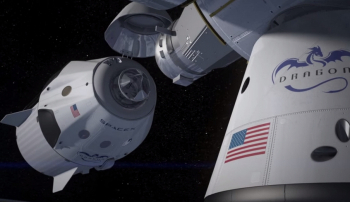 There’s even a schedule possibility of a Boeing CST-100 at the Station with a Dragon 2 and a Dragon CRS mission – with two Commercial Crew ports planned. Such a scenario – even with “just” the two Dragons – would be at the mercy of natural schedule changes, especially with dates two years into the future. It is also likely the commercial crew spacecraft will be spaced apart as schedules are refined. Following the conclusion of their test flights, each company will fly at least two Full Operational Capability (FOC) missions to the ISS. The first of these missions, USCV-1, was previously installed on the FPIP manifest for late 2017 – which would align with the successful completion of the demonstration flights.